Track use Oct 5th & 6th. 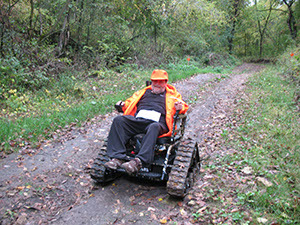 Frank very much enjoyed the use of the Track Chair and the ease of getting to his blind. Though unsuccessfull, Frank enjoyed his time afield. The terrain was hilly and muddy, but we had no problem getting to the blinds.